The basics for any network based on *nix hosts is the Transport Control Protocol/ Internet Protocol (TCP/IP) combination of three protocols. This combination consists of the Internet Protocol (IP),Transport Control Protocol (TCP), and Universal Datagram Protocol (UDP). 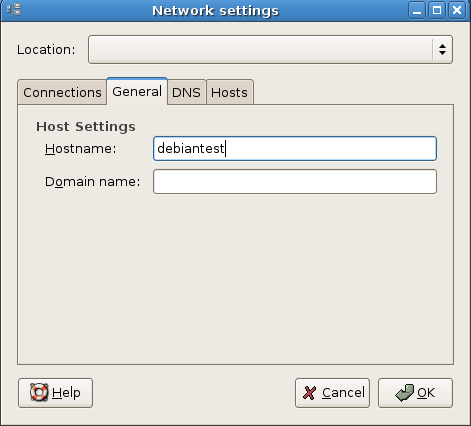 If you are new to networking the graphical configuration tool is your best method for configuring new hardware in Debian.We are going to use GUI tool “network-admin” to configure networking. Remember, you must be root to run network-admin. Next one you need to click on “DNS” tab to configure your system’s DNS settings, hostname, or DNS search path. Highlight an existing entry, and then click the Properties button to change /etc/hosts entries in the Hosts tab of the Network Configuration screen. 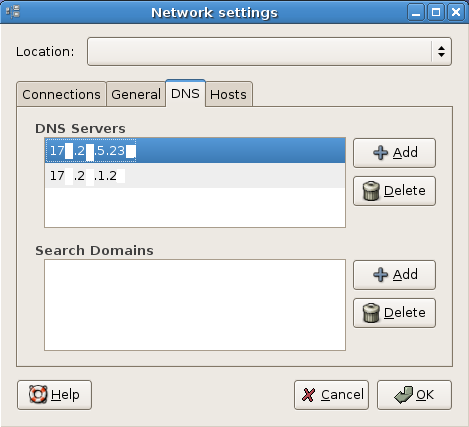 You can also assign different locations to your computer, especially very useful if you are on a laptop and move between several networks each requiring different configurations. Just select the gray bar at the top of the network-admin window and select Create Location. Enter a name, such as Home and then repeat this again to create another location, Work. 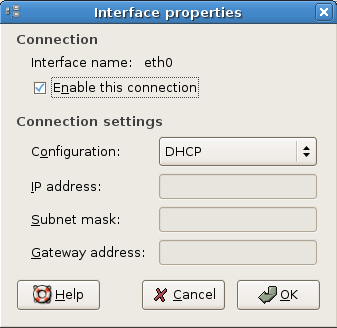 Each time you switch between locations, Ubuntu detects that it needs to use configurations specific to those locations, so for instance you might want to use DHCP at work, but not at home. Simple; just select the Home location, configure your ethernet connection to use a Static IP and you are all set to switch between your home and corporate networks. 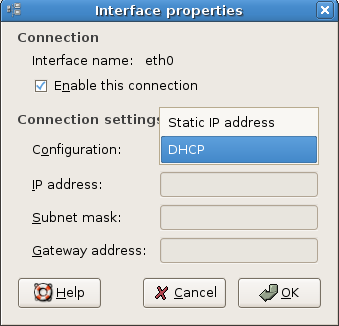 You need to enter all the details like address,netmask,network,broadcast and gateways values after entering all the values save this file and you need to restart networking services in debian using the following command to take effect of our new ipaddress. 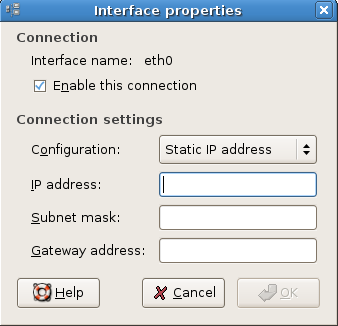 You can configure a network interface from the command line using the basic Linux networking utilities. You configure your network client hosts with the command line by using commands to change your current settings or by editing a number of system files. Two commands, ifconfig and route, are used for network configuration. 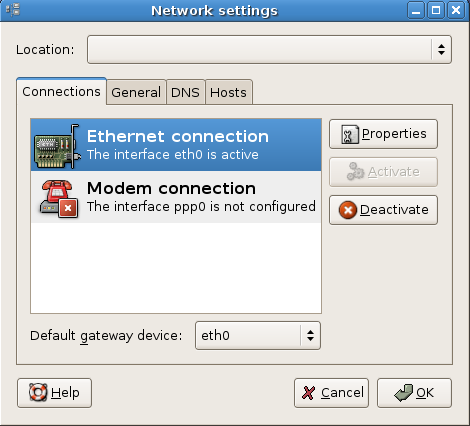 The netstat command displays information about the network connections. When it comes to DNS setup Debian doesn’t differ from other distributions. You can add hostname and IP addresses to the file /etc/hosts for static lookups. 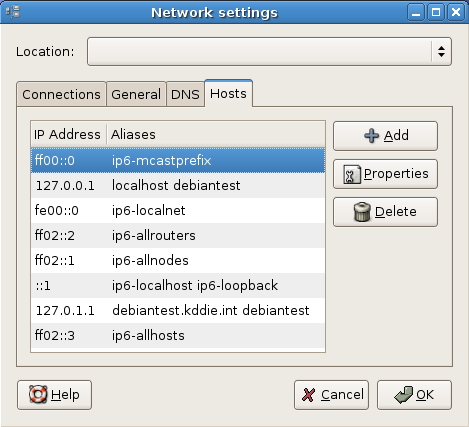 Ping is a computer network tool used to test whether a particular host is reachable across an IP network. Ping works by sending ICMP “echo request” packets to the target host and listening for ICMP “echo response” replies (sometimes dubbed “Pong!” as an analog from the Ping Pong table tennis sport.) Using interval timing and response rate, ping estimates the round-trip time (generally in milliseconds although the unit is often omitted) and packet loss (if any) rate between hosts. traceroute is a computer network tool used to determine the route taken by packets across an IP network. An IPv6 variant, traceroute6, is also widely available.Very useful to trace IP packets. The Unix command ifconfig can function as a tool to configure a network interface for TCP/IP from the command line interface (CLI).This is another easy tool to see if your interface is actually loading correctly. Your guide says that “Once it opens you should see the following screen”, but you don’t say what to do if the screen doesn’t show your connection. The screen does not show my USB Wireless connection. It only shows the modem option. How can I get it to detect the wireless adaptor? The boards have been no help. Try SimplyMEPIS (mepis.org). It always finds my wireless connections without any fuss. If it’s not showing up, it is likely that your hardware is not being detected. My experience has been that Mepis has better hardware detection than vanilla Debian or Ubuntu. Best wishes! I am facing a problem where after log-off/reboot, the content of resolv.conf file gets deleted, which results in “no-internet” of course. Up to now I havent been able to determine the reason for that. If someone has an idea how to fix this please share it as this is very annoying. Hi Pimmy, maybe DHCP server send you this configuration if your network card is configured to use dhcp. This article is great. Thanks for that. I got my Linux internet working. Surprisingly setting the eth0 also automatically enables the wireless. So that is good. Thanks again. hi. i would like to create a user in debian and give him admin rights probably just like root. is this possible? or how do i do it? then change the password for the user. 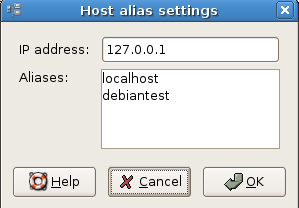 how do you save file after you have entered all of the values when you are setting up a virtual IP address in Debian. 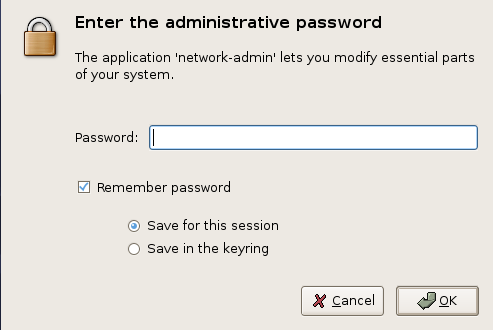 I have a virtual Debian which has lost its network driver (eth0 device not found) and am trying to see if this works. My Question is. Sir, I want to put TWO Different Subnet IP Addresses for ONE NIC Card in Debian OS. Because, I can access Internet using One IP Address AND Other one for accessing My Local network. This is my kindly Request for EveryOne. Please Do Help Me.